On June 14th, 2018, Audemars Piguet celebrated the debut of the 4th Audemars Piguet Art Commission with a press conference and cocktail party that we were invited to and with a recap to follow in the next couple of days. At the special exhibition named HALO, guests experienced first-hand the immersive installation, presented as a ten meter wide and four meter tall cylinder-shaped structure, made up of vertical piano wires and a 360-degree screen. This year, the Audemars Piguet Art Commission was conceived and realised by British artist-duo Semiconductor, Ruth Jarman and Joe Gerhardt, in collaboration with guest curator Mónica Bello, head of Arts and curator at CERN, the European Laboratory for Particle Physics in Geneva. HALO, the large-scale, site-specific artwork, presents visitors with an artistic interpretation of the ATLAS experiment at CERN, and marks the first time that raw data from CERN has been utilized within an art installation. Viewers were entirely immersed in HALO, surrounded by kaleidoscopic data projections generated by a series of slowed-down subatomic particle collisions that ordinarily occur almost at the speed of light at CERN’s Large Hadron Collider —LHC. As they hit the screen, the animated data points trigger small hammers that proceed to reverberate the artwork’s body, emitting an all-encompassing vibration resonating throughout the artwork. Artists Ruth Jarman and Joe Gerhardt of Semiconductor described the project, saying: “We’re interested in man’s signature on nature. Our aim is not to learn about the scientific knowledge, but seeing what it has become once it has been observed by man. This quickly becomes a process of pattern reading which is something we as humans are doing all the time. We want people to experience what we call a ‘technological sublime’, you don’t need to know anything about the science to do this. It becomes an experience”. Guest curator Mónica Bello said of the artwork: “HALO is highly original, truly intellectual and very scientific in its own uniqueness”. Developed out of their two-month residency at CERN in 2015, Semiconductor was selected by Audemars Piguet and 2018 guest curator from Spain Mónica Bello for their exploration of the limits of physical phenomena and their artistic interpretation of the natural world. The Audemars Piguet Art Commission collaborates with a selected curator and emerging or mid-career artist to realize a new artwork that is premiered during one of Art Basel’s three international shows. The aim is to amplify the artist’s unique vision, while using the complexity and precision inherent in watchmaking as the artist’s stimuli. This year, Mónica Bello helped select Semiconductor whose work reflects the continuing exploration of these themes, celebrating a dialogue between contemporary art, science, and technology. Additionally, during Art Basel in Basel at the Audemars Piguet booth, the brand also showcased the concluding design in a trilogy of lounge concepts by Chilean-born, New York-based artist and designer Sebastian Errazuriz, alongside a photographic series by London-based, Italian visual artist Quayola at the Audemars Piguet Collectors Lounge. Errazuriz’s Foundations, which is based on iron ore, the natural resource at the heart of steel and one of the principal resources for watchmakers, was previously on view at Art Basel Hong Kong, and will feature at Art Basel Miami Beach later this year, rounding out all three Art Basel shows in 2018, a venue where Audemars Piguet has presented innovative concepts in the Collectors Lounge since 2013. This design evolves from the previous lounge concepts which were inspired by two other core natural materials native to the Vallée de Joux —ice with the Ice Cycle in 2016 and then wood with Second Nature in 2017. Similarly, Quayola’s new photographic series, Remains: Vallée de Joux, unifies the natural roots of Audemars Piguet with his own visual artistry. Throughout 2018, Quayola’s artwork on the lounge will evolve, concluding in December at Art Basel in Miami Beach with the reveal of a new moving-image artwork: Promenade, a video diptych captured through drone technology and high-precision scanning. Quayola’s works use recent high-tech innovations to help viewers see the natural world in alternative ways, while his techniques reflect the careful craftsmanship and precision of watchmaking. Audemars Piguet has always sought to integrate creative vision with superb artistry and technical mastery. Pursuing its commitment to ingenuity, innovation, and a spirit of independence, Audemars Piguet formed a partnership with Art Basel in 2013, supporting the world’s premier contemporary art shows in Hong Kong, Basel and Miami Beach. Since, Audemars Piguet has presented innovative concepts at all three Art Basel shows, inviting artists to creatively interpret Audemars Piguet’s heritage and origins. At the crux of this involvement is the Audemars Piguet Art Commission. The Commission, announced in May 2014, draws inspiration from the craftsmanship and technical excellence inherent in Audemars Piguet’s legacy of watchmaking. Every year, an artist-curator duo is selected to realize a new artwork which explores complexity and precision, while enlisting contemporary creative practice, complex mechanics, technology, and science. By inviting artists to push the limits of technical virtuosity and scientific ingenuity, the Audemars Piguet Art Commission forges a link between the traditions of Haute Horlogerie and Art. Recipients are given 'carte blanche' to realize each Audemars Piguet Art Commission. Audemars Piguet provides full financial support for each commission, in addition to specialized expertise required to realize an artwork. The first Commission, unveiled to coincide with Art Basel in Basel 2015, was created by Swiss artist and composer Robin Meier, and curated by Marc-Olivier Wahler. Synchronicity explored the underlying mathematical rules of self-organization among seemingly unrelated components: fireflies, computers, crickets, sounds and electromagnetic pendulums. In 2016, Audemars Piguet announced Sun Xun as the second artist for the Audemars Piguet Art Commission. Considered one of China’s rising young talents, Sun Xun unveiled on the oceanfront at Art Basel in Miami Beach 2016 a large-scale immersive bamboo installation and 3D film titled Reconstruction of the Universe, comprised of tens of thousands of hand-carved woodblocks.. The following year, Los Angeles-based, multidisciplinary artist Lars Jan was selected for the 3rd Audemars Piguet Art Commission. His large-scale Slow-Moving Luminaries installation, curated by Kathleen Forde, was also realized on the oceanfront at Art Basel in Miami Beach 2017; it explored topics of oscillations, including time, memory and the changing climate. Parallel to the Commission, Audemars Piguet supports annual projects whereby artists create works that offer their own, highly personal interpretations of the company’s cultural and geographical origins. Conceived on a smaller scale when compared to the Commission, these projects testify to the deep and fertile dialogue between two distinct areas of creative endeavor —contemporary artists and watchmakers—and they are emblematic of the company’s most deeply held values. In 2013, Audemars Piguet commissioned the first of these projects: new photographic works by British photographer Dan Holdsworth. It also worked with Galerie Perrotin on Curiosity, a pop-up installation by French art duo Kolkoz for Art Basel in Miami Beach 2013. At Art Basel’s 2014 show in Hong Kong, Audemars Piguet unveiled a new panoramic film, Measure, by Austrian videographer Kurt Hentschläger. For Art Basel’s 2014 show in Miami Beach, Audemars Piguet contributed to an international sensation by partnering with the Peabody Essex Museum to co-present Theo Jansen’s Strandbeests, animal-like kinetic sculptures harnessing wind power to walk along the seashore in Miami Beach. In 2015, Audemars Piguet presented an eco-wall of living mosses combined with a sound installation titled Wild Constellations by Geneva-based artist Alexandre Joly. In 2016, the brand presented its new exhibition at the Yuz Museum in Shanghai, which displayed an original video-work, Circadian Rhythm, by Chinese artist Cheng Ran. 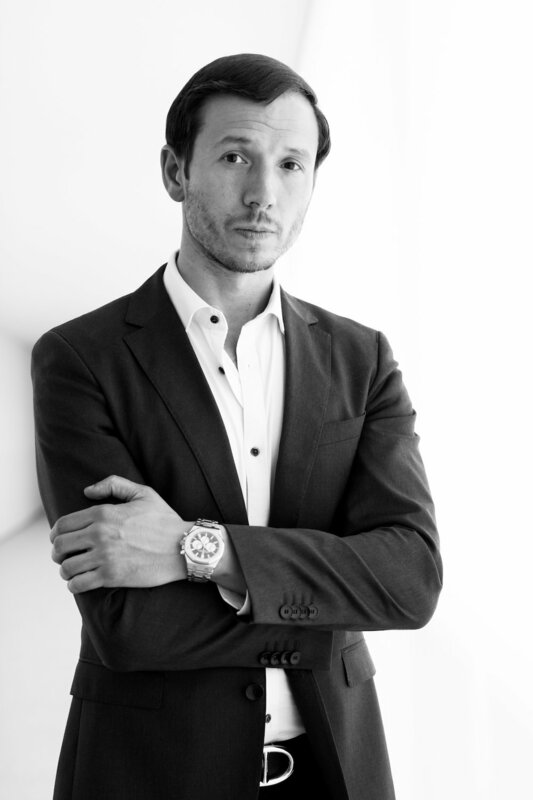 Starting in 2016, Sebastian Errazuriz’s dynamic, immersive lounge designs have complemented Audemars Piguet’s presentation in the lounge at each Art Basel show. This year’s design, titled Foundations, is the final in a trilogy of concepts by the Chilean-born, New York-based artist and designer, each based on a natural element found in the Vallée de Joux. 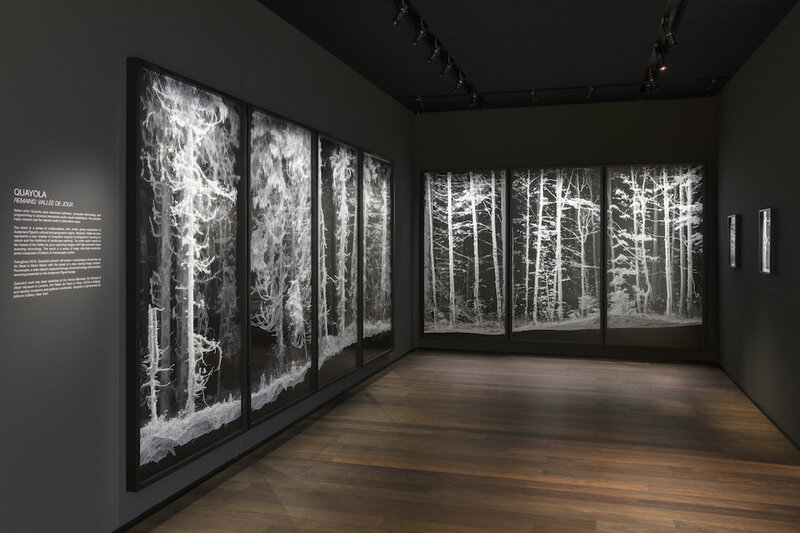 Throughout 2018, Errazuriz’ design is being shown in tandem with a new photographic series titled Remains: Vallée de Joux by London-based Italian artist Quayola, who uses film technologies to depict Audemars Piguet’s origins. Semiconductor is British artist-duo Ruth Jarman and Joe Gerhardt. Working collaboratively over more than twenty years, the pair creates works that push the boundaries of the moving image as a visual language. Through their immersive installations and screen-based projects, they explore the material nature of our world, and how our experiences get shaped by the lens of science and technology. Many of their works have been developed during fellowship opportunities, which have taken them into laboratories where they can observe how scientists create an understanding of the material world, including at CERN in Geneva; the Department of Mineral Sciences at the Smithsonian National Museum of Natural History in Washington, D.C.; the Gulbenkian Galapagos Artists’ Residency; and the NASA Space Sciences Laboratory at the University of California at Berkeley. Founded in 1970 by gallerists from Basel, Art Basel today stages the world's premier art shows for Modern and contemporary art, sited in Basel, Miami Beach and Hong Kong. Defined by its host city and region, each show is unique, its individual character reflected in the participating galleries, artworks presented, and the content of parallel programming produced in collaboration with local institutions for each edition. Art Basel’s engagement has expanded beyond art fairs through a number of new initiatives. In 2014, Art Basel launched its Crowdfunding Initiative which has catalysed much-needed support for outstanding non-commercial art projects worldwide and helped garner pledges in excess of USD 2 million in support of around 70 art projects from around the globe – from Bogota to Ho Chi Minh City, San José and Kabul. For Art Basel Cities, launched in 2016, Art Basel is working with selected partner cities to develop vibrant and content-driven programmes specific to the individual city. Connecting them to the global art world through Art Basel's expertise and network, Art Basel Cities supports its partners to develop their unique cultural landscape. For further information, please visit artbasel.com.